Sleep is becoming a moving target for me. Maybe I am getting older. Maybe I am just stressed. Maybe I just need less sleep. Hard to know, but sleep ... at night, can be a hard thing to achieve. And sleep during the day (a.k.a. nap) is impossible. I am a bit of a control freak! Sleep cannot be controlled. I can't will myself to go to sleep. I can't just determine that at 10:00 pm, I will be asleep and I will stay asleep till morning. This sleep issue can be a really a problem for a control freak! Maybe it is a problem for control freaks because sleep is about letting go, relaxing and accepting the idleness of rest as an important goal for health! Yarn - for the letter Y.
I do knit with yarn, do make sweaters and socks and hats and scarves, but over the years I have had to create another description for myself because "knitter" doesn't really capture the scope of my yarn stash. I am now a "collector" of yarn. You see, my current "stash" (a knitter's term for yarn they own, but have not knit up), my current stash is more of a collection in size and diversity. I enjoy knitting, but I also enjoy the ownership. I love being able to go down to my basement and "shop" in my own "yarn store", where nothing is for sale, where I am the only customer, where I don't have to wait for a sale. I won't outlive all my current yarn stash. I once figured out that knitting 5,000 yards a year, I could knit for 23 years without purchasing yarn. And at that time I was appalled! Ridiculous to have so much yarn, I thought! Maybe I should get professional help to curb my desire to acquire more?? Nah! That was one stupid idea and I dismissed quickly. Now it is a collection. I am happy and proud to have it. I love every skein. I am a yarn collector. X - is for the spot - X marks it. So the letter X was a bit of a challenge. For days all I could think of was "X marks the spot". I resisted but finally decided, why not!! I googled "X Marks the Spot" and discovered a meaning and origin I never knew for this phrase. When I used this phrase, I always thought a pirate map with a big X marking the location of treasure. And that is one of its meanings. But it has a more dismal origin. What is said upon finding your target has been marked out. Derived from an X on pirate treasure maps. The phrase was put into common usage by the British army, who performed executions by marking a piece of paper with a black X and positioning it on the heart of someone sentenced to death. The acting officer would say "X marks the spot" and the firing squad would shoot the X.
Yikes! I don't know about you, but #3 gave me pause. A colorful cartoony pirate map always came to mind when I said those words. Not now. Doesn't it make you wonder the origins of other commonly used phrases? Curiosity might make you check, but a darker discovery might make it far less fun. I am a big believer in "Walk the Talk". Being a full time care giver for a declining elderly person is really a test of that idea. It is alot like raising a child (which I did twice), but raising children moves forward, builds, matures and creates an independent being. Care giving of an elderly person moves in the opposite direction. Backward steps occur frequently, forward progress (like in rehab), never return someone who is 85 to their previous level of function, but it does allow them to return to normal living ... a new normal for them. And that is the challenge of "walking the talk" in this care giving role. Being able to accept the downward slope of progress, accepting the new normal for a loved one, and continuing to walk this path is hard. Heartbreaking at times. But it is a debt I owe to the mother who raised me, who helped me survive in a dysfunctional family, and who had a hand in making me who I am today. She was far from perfect, but she lived in a situation that I could not tolerate - until she was widowed! And when I come to the end of this walk, and begin another, I will have no regrets for my actions during this time. I will have done my very best to make her last years good and as healthy as possible. Vigilance was not my original topic for V. But after the hospitalization and the current rehab, Vigilance is all I have been doing. The role of a caregiver in a medical setting is pretty much to inform, to be vigilant, to ask questions, to be vigilant, to monitor, to be vigilant, to be persistent, to be vigilant, to be patient, and to be vigilant. Did I mention Vigilance?? It began with a trip to hospital ER with her shortness of breath. Her history and current problem are repeated, and repeated and repeated as each new medical person enters the ER room (I am not sure why they have medical charts.) Sprinkled between those repeats are my questions, making sure they haven't slipped something in to her treatment that she is allergic to or cannot tolerate. And to monitor the ongoing treatment, to report her ongoing symptoms, to request changes to treatment (frequently - because asking once doesn't seem to count). And that was just the hospital. Rehab has been more of the same! Not with medications so much. They seem to be able to read the chart! But her diet was wrong (no salt means no salt - not just taking the salt packet off the tray) and that took 4 days to correct. Congestive Heart Failure most definately is a salt free diet!! And then there is the vigilance of keeping mom's spirits up. She tends towards self-pity and discouragement - and if I was 85 and frustrated beyond measure and afraid, I might have alittle of that myself. But thankfully she has a daughter who has no patience for that, who reminds her daily that she is one lucky lady - who has family who is with her constantly through this trial, that she is healthier than most of the people in rehab, that she is getting well, that she is in a beautiful facility (believe me, they have some rehabs that are terrible), that she will be going home (some people live here and won't be going home.) Now all that great stuff doesn't come without a price - she needs to work! No work and she stays longer. We have had that conversation several times, sort of a tough love talk. She is not happy that I am now saying to her - oh, no, you can button your pajama tops yourself, you can adjust your own bed, you know how to work that TV remote. Vigilance. Persistence. Reminders that her glass is half full! Anyway, that is my life now! Thank God I am good at Vigilance!!! Oh, and did I mention that I am pretty tired? That goes with being a caregiver too - but I already did the letter T.
I want my life back, I want her life back, and she will work and improve if only to shut me up!! Well I have been gone for about a week. Alot has happened. To begin - mom is getting better. She is now in rehab, and I am forever grateful that she is on the mend. I am most grateful for the concern and prayers expressed for her recovery through this blog. I am very sure they made a difference. Tomorrow, Sunday, I will bring my computer to mom's rehab facility (my second home now), and post the last week of postings for A to Z. I really enjoyed this blog fest and I want to finish it out. Thank you, thank you, thank you to all my wonderful new blog friends and my long term friends during this time. It really does make a difference to know that others are thinking (and praying) that things will improve. They have, and I am very glad. And it is Unbelieveable that life can make such a drastic turn and come back around again. My mom was hospitalized earlier this week, and I have been totally involved with her care. Postings up to this point were prescheduled. Starting Monday I will probably fall behind with my posts. I have already fallen behind on reading posts. But I will catch up at some point. For those who pray, please keep my mom in your prayers. Her spirits are very low and they haven't been able to fix her problem. Oh no! The last week. What am I going to do when this is over? The first thing I am going to do is identify 5 postings I want to share on May 1st. Then I am going to take my 1000+ blog links and continue to check them all out. I have been struggling to keep up with what I have. No time to check out others. Will do a little of that in May. And then I have to keep up with the blogs I am following. And I have to do May posts. and then I am starting my 2012 list. As stuff occurs to me I am going to create the topic list so I am not scrambling again next year. There is going to be an A to Z April Blog Challenge next year right? Gosh, I haven't finished this year and I am already worried about next year! Someone called me an "overachiever". I think they are right! Overachiever - an O word!!! Here I come 2012!! I love big weather events. The most common weather event on the East Coast of the USA are thunder storms. We can count on several in the fall and spring, and sometimes even in the summer. This year we even had a snow thunder storm. The bigger and louder the better. I love to stand by the window and just take it in. It is a reminder that we live on an ever changing planet with its own agenda. Humans sometimes forget in the small busyness of their individual lives that our Earth is still changing and developing - in very big ways - not necessarily all the time, but when it does show its muscle with dramatic weather, earthquakes, tsunamis, volcanoes ... all other human events are temporarily stopped and we pay attention to our earth. One night a big, big thunderstorm had descended on our community. I was enjoying the sound and noise of it all when a lightening strike landed right behind our town home. The boom was enormous. The light created was almost blinding. It startled us in its massiveness. And then the unexpected happened. Our neighbor's alarm system became activated and the horn started its very loud wailing. Now our neighbors at the time were renters - a single woman and her young son. We thought the alarm system had been disabled by the owners when they moved out. We were friends with the owners, and I knew how to disarm their system. We also knew the horn would blow for 6 minutes, then turn off. That is what we knew. What we didn't know - was what the renters knew!! So we waited and waited. The alarm horn was almost as loud as the storm and the horn wasn't even in our house. The lightening kept flashing. It was a long 6 minutes for us. And when the horn didn't stop after 6 minutes, we got concerned. We waited another 5 minutes wondering what we should do. That horn kept going (and so did the storm). So my son and I suited up and went next store. From door to door, it is about 30 feet. We knocked. Nothing. We could see lights. We knocked louder. Nothing. We banged ... finally they could hear us and opened the door. We were two drowned rats, but I remember that our neighbors were sure glad to see us. They knew nothing about alarms. This is the closest I ever got to a "rescue mission in a storm". It wouldn't make the national news but we made a difference to two very upset people. Check it out. You won't be sorry. How many readers did I capture with this topic? And how many will read through to the end? You see, Milo, my youngest grand-dog, celebrated his first birthday this month. 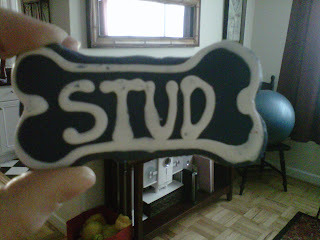 My daughter's neighbors gave him this present for his birthday - a dog bone with the word "Stud" on it. He so reflects that attitude. Even his "cousins", Meathead and Grimace have picked up on that stud attitude. And they don't like it much. A picture is worth a 1000 words!! His stance says "I own this street, this sidewalk, this bone, this bed, this mama, this food, this treat ..."
Even in rest - one studderly eye is open as if to tell me, "Really, Grandma, put down that camera and turn out the lights. A guy needs to get his rest." I am a closet Royalty Watcher. English Royalty. I know it is a little silly and probably a tad juvenile, but there it is! I am fascinated by all of it: a nation that supports a royal family, long histories of royal families, the wonderful clothes, and the activities of their daily lives. And why in the 21st Century do we still have royal families when clearly their function as rulers has pretty much disappeared? Their lives are different. Born into a life style, and a job, and a family with a bigger-than-life history, and a massive expectation for their future - isn't that one heck of a lot to be born into? How do you build your own life knowing that your choices are limited to the "family business" and that your children's lives must fit that plan as well, and their children's children, and so on. What must living that kind of life be like? I find it fascinating. And my enjoyment goes beyond the current royal family. I love the Tudor history and the movies about King Henry VIII, and all his wives. And who doesn't know the story of his children, most pointedly, Elizabeth I, the Virgin Queen. And then there is Queen Victoria, another big famous Royal family. And now we have the current royal family - House of Windsor: another Elizabeth (who appears to be going for the record as a ruler), a prince in waiting (and waiting, and waiting - poor Charles), a princess deceased (a people's princess - Diana), two handsome, charming and well-balanced sons (William and Harry, thank you, Princess Diana), and a commoner-soon-to-be-princess and eventually Queen (Kate, dear Kate, have you really thought this thing through), and, ta-da ... a royal wedding on April 29th! And about that wedding ... I want to know about the dress and the wedding rings (he isn't wearing one, did you know that? ), and the guests, and the ceremony, and the parade (there will be a parade right? ), and all the pictures, and ... oh, maybe I go on too much! So were do you stand on royalty! Keep Friday, April 29th open for "THE Wedding" - these big royal celebrations don't happen all that often! I feel like I am cheating with Quotes as my topic ... but Q - I just couldn't get going with Q.
Quaker - interesting topic but would take alot of research. Then I thought Queen - like in Queen for a Day (the old TV show) - but probably 75% of my audience would know what the heck I was talking about. And then there is Quest. No. Not inspiring. Briefly I thought about Questions - since I was questioning what to write. I had almost settled on Quarantine. But that also died a quiet death. Finally I started searching for Quotes. And I had a few very good laughs with these. So today it is Quotes! "Before you criticize someone, you should walk a mile in their shoes. That way when you criticize them, you are a mile away from them and you have their shoes." Pestilence is such a juicy word, don't you think? I mean, how often does one use "pestilence" in daily conversation? I don't think I have ever used it - hence the need to use it now. When I hear that word I think of medieval times, when pestilence was a problem. Is that why we don't use it? It is an "old" or archaic word that has fallen into disuse because it doesn't describe our world today? Then I got to thinking ... is the word pestilence - what I think it is. What does it exactly mean? Could I use it in a sentence if I had to? or wanted to? or strived to? hmmm... maybe not in the 21st century. And the cover price was almost $80 - a lot of money now and more money in the 1980s when we were a struggling young couple with 2 small kids. The book is at least 6 inches thick and you could break a few bones if you dropped it on someone's foot. And I never used until I looked up "pestilence". Do you think I got my money's worth? Well, I think pestilence is at least $80 word, don't you? Power is like a desolating pestilence. Yes ... this is definitely a 21st century word! Note: Today is my birthday. Maybe I should have chosen a different topic, like Present or Party for P.
No ... pestilence is so much more interesting!! Gosh, this is really something. I really wanted one - but now I have two. This was awarded by JL Dodge at Dodge Writes. So tomorrow is my birthday - officially 64. And I thought - why not write my Obituary! I can hear the chorus of readers now!! "HEAVENS," you say, "why would you want to do that? Isn't that depressing? morbid? odd? premature?" Yes, I am hoping it is premature. :-) And it may be a little unusual. But a resounding NO to the other stuff! Not depressing or morbid. I consider it a reality check. My obituary is what I want people to know about me - and remember me for after I am gone, AND, creating it now gives me a chance to see just how close I am to those things. I mean, if I died tomorrow ... would I be able to use this Obituary!!! A news story that reports the recent death of a person, typically along with an account of the person's life and information about the upcoming funeral. Where did they live during their life? Where did they live at the time of their death? Where did they go to school and what degrees did they attain? What did they do professionally? What awards did they achieve? What hobbies did they have? Really, who cares about that stuff after you are dead. Think about it. Strangers reading the newspaper don't care where you went to school, what degrees you were awarded, how professionally stacked you are - I mean, used to be! And your family already knows this stuff. And the deceased person - is that really how they want to be remembered - with an impersonal listing of accomplishments? Yes, I have an advanced degree, yes, I had responsible jobs. Yes, I had some worthwhile achievements - No,I don't care to share them. They are just not who I am. Here is how I want "the account of my life" to be remembered. The black bold print are the actual words I want to use in my Obituary. The blue and red print is my assessment of how close I am to the words. or maybe something note worthy like 110. That one I nailed. I love easily. Makes it easy to hurt me as a result. Blessed with the happiness gene. Seems whatever plows me down, I get back to happy eventually. Some times it takes longer than others to recover, but it is my "norm". and they turned out pretty fabulous. Just ask them! I have cared for my husband and family - even when they acted badly. I was not always perfect in the caring department, but I "walked the talk" most certainly. Not when it counts. My mother tests this quality every single day. Forgiving a hurt is very, very hard for me. I am pretty good at "forgetting", but "forgiving"? I used to trust without restraint. Not so much anymore. Got burned. Most Happy When Knitting or Sitting With My Granddogs. So until I can rid of all that red print, I can't use this Obituary - and I can't die. Oh, wait, that is tomorrow!!! Each day since April 1, I visit each blogger, read the posts, read the comments, usually leave a comment and move on. At that time I had 20 followers. (I was swimming pretty good at this point). Each day I find new blogs to follow. Sometimes I reach back into their history and see what they wrote about prior to the challenge. Gosh, I discover there is alot of good stuff out there. New folks find and follow me (Yeah!!). I visit their blog. Wow, how could I have missed this person? I follow them back. I look back to their postings starting on April 1 - maybe further back! Each morning, I log on to my computer. Yikes! 54 unread postings. I dig in. I start reading and responding. I get caught up, mostly. After lunch I check again!! More! Double Yikes!! And I repeat! Let's all take a break this week so we can all catch up!! Okay, so that is a stinko idea, if you want to meet the April challenge. And I will be standing on April 30 with a minimum of 26 postings under my belt. But I have made a discovery. A discovery that none of my blog friends warned me about. The REAL challenge of this month isn't writing the daily posts to your own blog ... it is keeping up with the bogs you follow! Do you read every one's blog? Do you comment all the time? If you get behind do you delete or just wait until you have more time ... say a week to catch up? How much time do you spend on blogging each day - the whole process: creation, reading, commenting!! Do you do something I haven't mentioned to keep from drowning? Inquiring minds (of new bloggers) ... ok, it is just me, I want to know. (PS - I love you guys. Don't stop posting! Don't stop following! Don't stop reading! Don't stop commenting! I think nostalgia is a dangerous thing. Wikipedia defines nostalgia as "yearning for the past, often in idealized form". That pretty much defines what my life has been for the last year - yearning for the "idealized" part of my past. I know all the cliches. Life is about changes. Nothing stays the same. We all change. When life sends you lemons, make lemonade. I know all that! But when I think about the past - and it is idealized I recently discovered - I can't help but be nostalgic for what I preceive to have lost. Even if it was not as good as I remember, I would like maybe one of these back. My husband had his full eye sight and could drive. We could hike and enjoy the outdoors. Mom was able to think and function on her own. She didn't need a caregiver. Broken family relationships were whole. My grand-dog meathead wasn't epileptic. I vacationed and spent holidays with my extended family. I could sleep through the night without interruption. Of course, nostalgia steals from me the wonderful things I have now. My husband still has sight. We have a happy and healthy marriage despite the extreme pressures of the past year. My mom is still alive and living with me. I have a wonderful family generally - better than most despite recent losses. My adult kids are part of my life. They are successful and happy. I have friends and family that have been there for me ... and not just when things are going well. Meathead's seizures are finally - after many years - controlled with meds. My son is engaged to be married to a beautiful and caring woman who fits our family perfectly. I have more wonderful bullets here - than in my nostalgic first list. The word nostalgia has a nice homey feel to the ear. But when the emotion of nostalgia is examined under the microscope, it is an emotion that puts you at a disadvantage. It takes rather than gives. It is only good when looking in photo albums, not in living your life. Wanting what you cannot have from the past (or the future) - is bad. Focus on the now - and enjoy it! I work on that every single day. 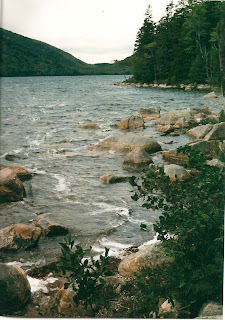 One of my favorite places on earth is Bar Harbor, Maine and Acadia National Park. If you like rugged coast lines, wilderness, hiking trails, horse drawn wagon rides, beautiful lakes, breath-taking views ... you need to visit this place. Some of my very best memories were created there, as well as one "Mortifying Memory." The story begins with great expectations! 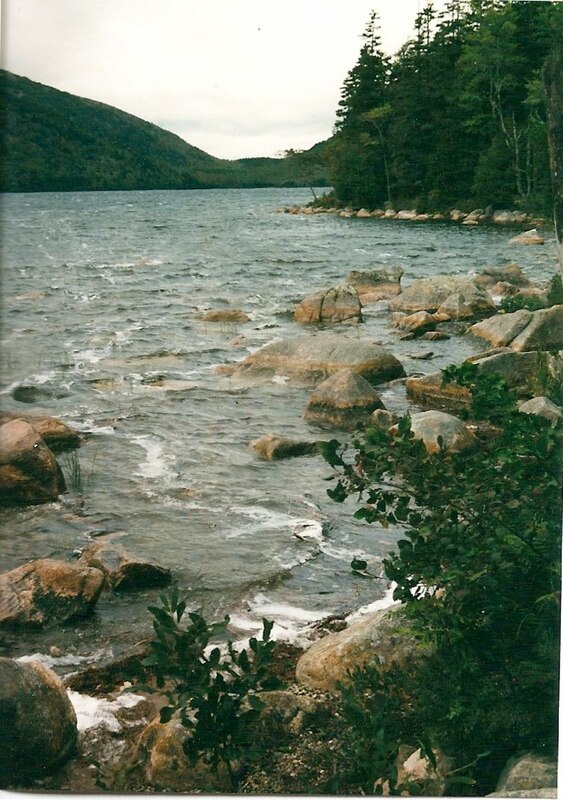 On our first trip in 1998 my husband and I discovered Jordon Pond. The walk/hike is measured about 3 1/4 miles around. The guide books suggested allowing 2-2 1/2 hours to walk it due to the rough terraine. But things were different on our first trip. Only about 30% of the trail was graded and graveled. The rest was a mix of tangled roots, raised boards for keeping hikers off the delicate ecosystems, some forest paths, and there were about 5 large man-made rock falls that you had to climb over. 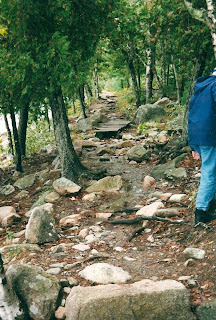 The guide book rated the first 30% of the trail as a 1 - and a the balance of the walk as 3-4 in difficulty. We were regular walkers, we read the guide books carefully, the hike was vertical, we had the right shoes, and we had the attitude. We were full of ourselves. We would conquer Jordan Pond. 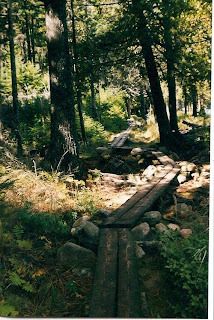 (Pictured: part of the trail that was uneven and hard walking.). We walked the easy part first. We were passing folks. We were commenting on their sandals, or inappropriate clothing, and how they wouldn't make it the whole way around. We were "experienced". Then we got to the more difficult parts. First came the roots. There were deep ruts everywhere. Lots of them. It was very difficult on the ankles. It was slow going but we were careful. We watched many people turn back because of that first section. Then came the raised boards. They went on for quite a while - through some beautiful sections of woods. It was quiet and peaceful - and we didn't see many people, because many had turned back. It wasn't difficult to walk the boards, but you did need to pay attention to your foot placement. We then came to our first section of boulders. 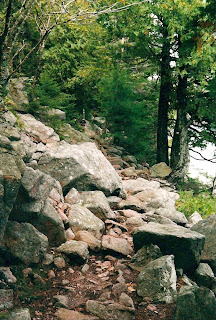 The boulders were several hundred feet across, and traveled a fair distance up the hill and down to the water. You couldn't avoid them. And, of course, we weren't going back. At this point our self-esteem was involved. We pushed on. We were a little tired, but very confident that we could manage this. And then we got a mortifying reality check. To our left, 3 older women started the climb cross the rock fall coming toward us. They had been traveling not too far behind us apparently. Two women were walking on either side of a very elderly woman. She was bent over, struggling a bit with the rocks. She was using with 2 walking sticks. I wanted to jump up to help, but ... the legs were a bit rubbery. No point embarrassing myself. We struck up a conversation as they neared us. Apparently the very elderly woman was celebrating her 80th birthday that day. She had walked Jordon Pond on her birthday for years. Her companions were "younger" - one 68 and one was 76 and they were here to help her make the trip around the pond. The Birthday Girl shook off my offer to assist her (thank God - it would have been most embarrasing if she had to help me off my boulder!). She said she was fine. She wished us a good day. And on the three of them went without a backward glance. My husband and I sat there for a few minutes pondering what had just happened. I jumped up! I remember throwing out comments like - "lets get going", "rest time is over", "hup-hup!!" or something stupid like that. I did not make any further comments about being tired, or thirsty or hungry!!! When we caught up with them, we cheerfully waved our good wishes and sprightly moved on past them. We were not recovered by a long shot, but in 1998, we were about 30 years younger than the birthday girl, and action on our part seemed ... (searching for a word here) ... REQUIRED! Needless to say, we beat the 3 elderly ladies back to the beginning of the trail, but I am guessing just barely. :-) And we did it all in a "speedy" 4 1/2 hours! 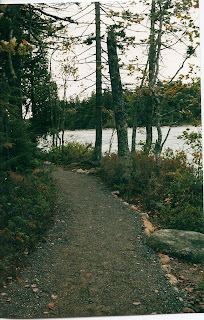 On our second trip to Jordan Pond (1999), my husband and I were once again walking the trail. He slipped off the boards and broke his ankle. I have a feeling that the spirits of Jordon Pond were putting us in our place!! We don't have many pictures of our 1999 trip because we spent most of it in the Bed and Breakfast with his foot elevated! (Pictured: My husband and I returned a third time to Jordon Pond - 2005. No broken bones and we made it around the pond without problems. This time we prepared. I wasn't going to be embarrased by another 80 year old woman with 2 elderly companions. they're generally not killing each other. You may have noticed that I prefer humor and laughter to more serious subjects. Laughter and a humorous approach to life is important to me. It is how I communicate best. I wasn't born with a particularly sophisticated sense of humor. Our family didn't have much to laugh about. But when I met the man who is now my husband ... I was instantly drawn to his witt and ability to make you laugh. It was a very important trait a person I hoped to spend my life with. We have had many many belly laughs together. And thankfully, he has passed that sterling trait on to both our children. I sincerely believe the Alan Alda quote says it all. If we had more laughter in our world, we wouldn't be killing each other. So I will end the posting with a joke - one that made me double over in laughter years ago when I was about 20. I remember telling this joke to my parents. I could hardly get it out for all my chuckling. Once I told the joke, I noticed they were still staring at me - you know, like waiting for the punch line which I had already delivered. When I pointed it out - that the punch line had past, they tried to recover, tried to join in with a forced laugh - lamely as I remember - and I am sure they were wondering had I slipped off my rocker. So I am hoping better from you guys. Here goes! What goes Hippity-Hop through the mud? The answer will slay you! Knitting is my passion - and it helped me come back to being me! (At this point I know half of my readers have clicked on to other blogs. Knitting and I came together in 1997. There is a back-story. There always is! At that time I was coming out of a high pressure management job, and I was very unhappy. As part of my recovery from that experience I came recognize that I had created my unhappiness with my own actions. I loved the job (the responsibility, the people, the work, the challenge). I did nothing but the job (no hobbies, no fun, no time, no nothing). I lost perspective in the job (no boundaries, no limitations - job, job, and more job). I lost compassion and understanding in the job (My way or the highway!). I changed to someone unrecognizable in that job (b*tch, comes to mind). I survived the job (Because I quit - sometimes you just have to say "uncle" and move on). In the months after leaving that position, I had a great big void in my life to deal with. Yes, I was still working. My employer liked me enough to offer me another position. (Go figure! Guess they couldn't hear my self-talk!) The new job was less stress, less prestigue and less money, but it was more structured, more predictable, and more do-able. But there was all this free time now - a huge void - a space to fill. I think I forgot how to be me. I had to figure that out. As part of "figuring it out", I began to read for pleasure again, exercise again, spend time with family again (yes, even family seem to fall off my radar) ... and explore a new hobby. When I asked my husband about spending money on a class for learning to Knit - his response - "Go for it. It is cheaper than therapy." It was better than therapy too. The act of knitting has a bunch of advantages. It has a start, a middle and an end. I needed more of that in my life at that time. It had a mediative quality to it. Knitting long stretches of the same stitch results in a lot of time for pondering other things and relax the mind. It was a thinking-person's hobby - complicated stitches and adjustments for fit can take a lot of focus and planning. Now 14 years later, my final projects are much better, my life is much fuller, and my downstairs closet is pretty full too (yarn stash - an addictive thing - come back when I do the letter Y.) I also own almost every knitting tool known to man. So knitting is a worthy topic for the letter K. The only topic really!! At least for me. Thank you and an idea! ... You won't believe this! B - is for Books that make your hands smile. A - is for Aging. Don't flinch!